Just off the west coast of Scotland, Islay is the southernmost of the islands that make up the Inner Hebrides. 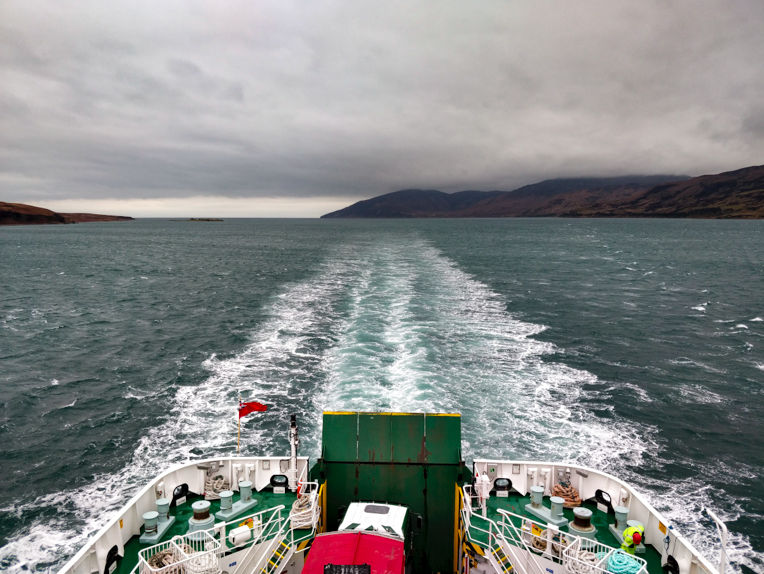 Islay (along with its next door neighbor Jura) is best known for its whisky. The peated, smokey kind to be exact. Together with S’s family, we ventured up to visit this stunning island for a weekend of whisky and gorgeous scenery. As we traveled with the family, we checked in to a bed and breakfast that had multiple rooms available and I think we lucked out. Margaret, the hostess, is wonderful. Her house is filled with spectacular antique furniture that makes everything feel warm and cozy. Plus, the breakfast is delicious and freshly made from all local ingredients. Our rooms all had a small decanter of local whisky - the perfect touch for the trip we were on. We were lucky enough to stop by Bowmore just before they closed, without a reservation. So we didn’t get to see the distillery itself. But that’s ok, because their visitor’s center is really incredible. Plus that’s where the tastings happen, so all was good. Bowmore Distillery is located in a town named for the distillery, which is also Islay’s administrative capital. (pictured above) We did the full tour of the distillery, which gave us the chance to see their original barley mill from 1881 along with the whole whisky making process. We learned a lot about the Laddie legacy, its not-so-simple history and how they own that signature stage of blue (known as Laddie Aqua, inspired by the waters surrounding the island). We also stopped by their botanics, where their delightful Botanist is made. If I be totally honest… This was my favorite. I knew it would be from the moment I walked in. Their respect for their history, mixed with their innovation and creativity, mixed with just really delicious whisky and gin, mixed again with great customer service and staff all leads to a great brand and experience. This distillery tour included learning about their whole whisky making process. 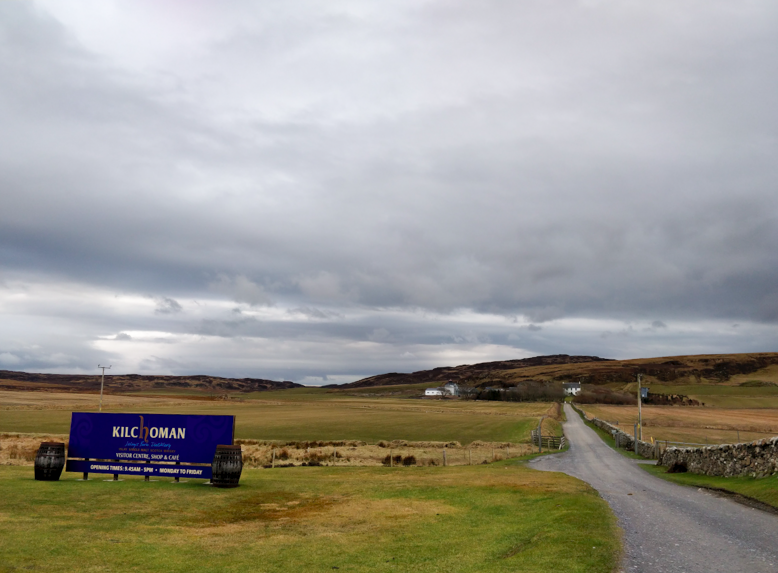 It was interesting to see a smaller, family run distillery compared to some of the bigger ones on Islay - and I highly recommend going just to see this contrast. This was the crowd favorite, the most picturesque and probably the most famous distillery I’ve ever been to. And it’s no surprise that even Ron Swanson is obsessed - they make the distilling process look like fine art. 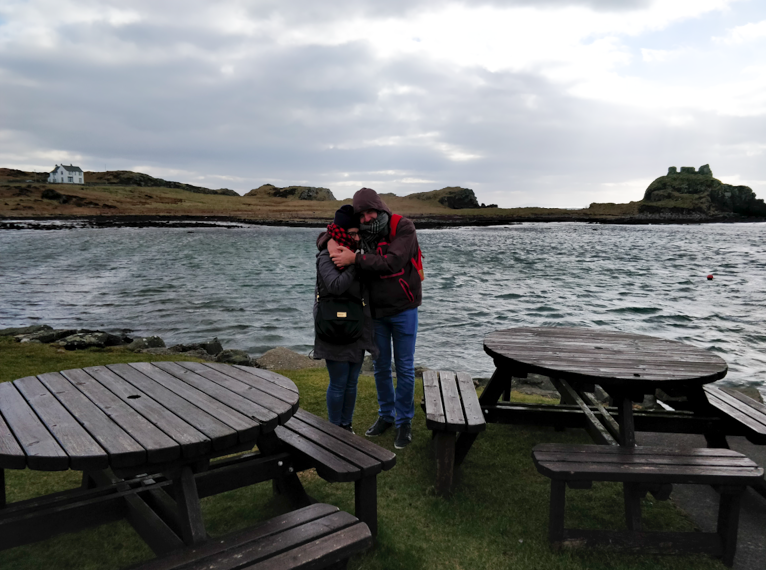 And yes, that’s us in the photo freezing our butts off on Lagavulin Bay. But it was worth it just to see the ruins of Dunyvaig Castle. 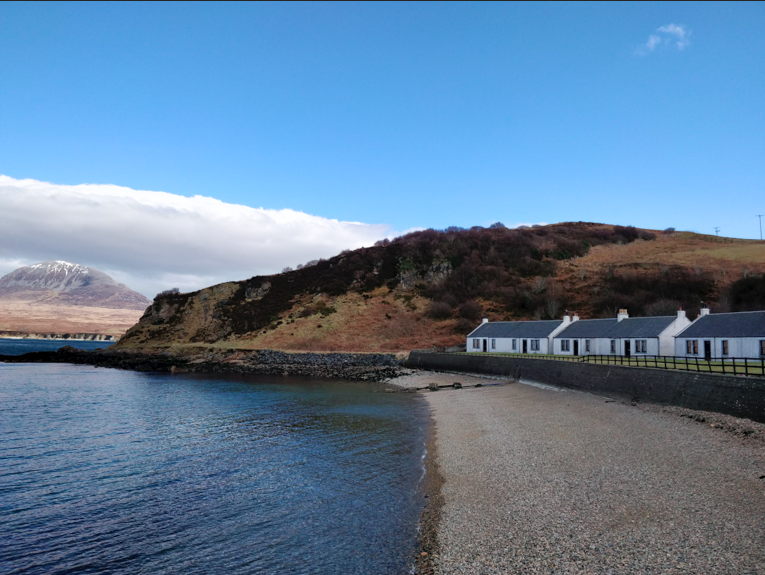 I was blown away by the beauty of Bunnahabhain’s little corner of Islay. Before our tour, we had some time to walk along the perfect stoney shore overlooking the Paps of Jura. We came for the Warehouse 9 Experience, aka a chance to taste whisky right from the cask. Our guide was hilarious and it was an unforgettable experience. Oh, did you think it was only about the whisky? Nah. There was a lot happening on our table - we ordered a seafood platter, lobster mac and cheese, Scottish mussels in a Guinness sauce… It was all unbelievable. 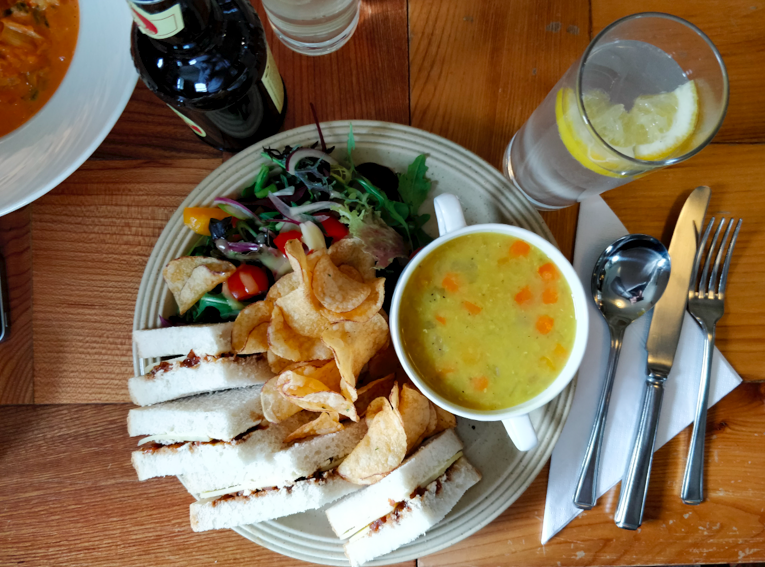 Here I stopped for a Islay cheddar + chutney sandwich that came with salt and vinegar crisps, a fresh green salad and a bowl of hot vegetable soup (pictured). It couldn’t have been more delicious and comforting. We dined on scallops, salmon, trout and had a delicious cheese plate for dessert.